How Does My Annuity Fit Into My Estate Plan? Selecting the right type of annuity for yourself is no small feat. Of course, you’ve put in the research and planned with your financial advisors. But, you might still be wondering what happens to those annuity payments upon your death. In addition to their benefits as a financial tool for your goals, annuities can have a positive impact on your beneficiaries after you’re gone — but only if you take smart estate planning steps to make sure your wealth ends up in the right hands. Your annuity type affects how things pan out after your death. In some cases, annuities end with the death of the annuitant. In other cases, the annuity payments continue to be distributed to a named beneficiary. If you haven’t already named your beneficiaries, it’s crucial that you don’t wait any longer. Make sure to work with your estate planning attorney when naming your beneficiaries because you’ll want them to be coordinated with your will or trust. Immediate vs deferred: You may have chosen an immediate annuity, which begins paying out as soon as your initial investment is made. This is a common choice for those nearing retirement or those looking to secure long-term income after a windfall like an inheritance or the sale of a business. However, many people opt for a deferred annuity and don’t begin receiving payments for some time. Deferred simply means that it begins paying out at some point after the initial investment. Fixed-period or lifetime: A fixed-period annuity only lasts for a predetermined amount of time (such as 20 years). A lifetime annuity pays out during the annuitant’s life, and these are commonly purchased for the lives of both spouses. Fixed-sum or variable: Within both immediate and deferred annuities, you’ve likely selected either a fixed-sum payment schedule or fluctuating payments depending on the performance of your investments in the market. It’s easy to think that including your loved ones in your will or trust is enough to cover your annuities as well. But if you want your children, spouse, or other individuals to receive your annuities when you’re gone, you need to fill out paperwork (in consultation with your estate planning attorney) that names those people as beneficiaries. Otherwise, your annuity sums could end up going to people you don’t want to leave your legacy to. There are a few different ways you can build death benefits into your annuity plan so that your wealth is passed on to your beneficiaries once you’re gone. Standard death benefit: The value of the annuity at the time of your death is passed to your beneficiary. Return of premium death benefit: Either the current value or the amount of the initial premium (whichever is greater) is distributed to your beneficiary. Stepped-up death benefit: The highest anniversary value is distributed to your beneficiary. In each of these cases, your beneficiary can decide if they’d like to receive this payment as a lump sum or over a period of time. With so many options, it’s a good idea to discuss an annuity with your estate planning attorney before you sign up for one. Your financial advisor works with you to make sure the annuity fits your financial goals and we can work with you to make sure it works with your estate planning goals. If you already have an annuity, it’s important to work with us as your estate planner to make sure it’s taken into account with the rest of your estate plan. It’s rarely uplifting to consider how much of your annuity value will be lost to taxation before being handed over to your beneficiary, but taxes are a fact of life (and estate planning). Your annuity will either be taxed as part of your estate (as an estate tax if you have a large enough estate) or as a disbursement to your beneficiary upon your death (as an income tax). However, in most cases, your spouse can continue to receive annuity benefits or inherit your annuity with little to no tax burdens. As with many estate planning and financial issues, choices you make about your annuity can make a big difference for your loved ones. You want to make sure you’re setting your beneficiaries up with the right kind of death benefits with as little loss to taxation as possible. 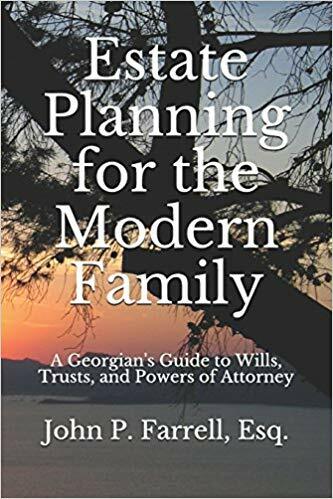 Give us a call today at (678) 809-4922 or get our book, Estate Planning for the Modern Family, so we can review your current annuities and explore ways to get more out of them for you and your family in the long run.